 Watertight stainless cord connector pre-installed in the split designed conduit box. For additional specifications and drawing... see "Specs" above for details. 1/3 HP, 1800 RPM, 1.4 Amps @ 208-230V, 0.7 Amps @ 460V, 28 lbs. 1/2 HP, 3600 RPM, 1.8 Amps @ 208-230V, 0.9 Amps @ 460V, 29 lbs. 1/2 HP, 1800 RPM, 1.5 Amps @ 208-230V, 1.5 Amps @ 460V, 31 lbs. 3/4 HP, 3600 RPM, 2.3 Amps @ 208-230V, 1.1 Amps @ 460V, 33 lbs. 3/4 HP, 1800 RPM, 2.4 Amps @ 208-230V, 1.2 Amps @ 460V, 33 lbs. 1 HP, 1800 RPM, 3.2 Amps @ 208-230V, 1.6 Amps @ 460V, 36 lbs. 1 HP, 3600 RPM, 3.0 Amps @ 208-230V, 1.5 Amps @ 460V, 35 lbs. 1.5 HP, 1800 RPM, 4.2 Amps @ 208-230V, 2.1 Amps @ 460V, 42 lbs. 1.5 HP, 3600 RPM, 4.0 Amps @ 208-230V, 2.0 Amps @ 460V, 39 lbs. 2 HP, 3600 RPM, 4.8 Amps @ 208-230V, 2.4 Amps @ 460V, 45 lbs. 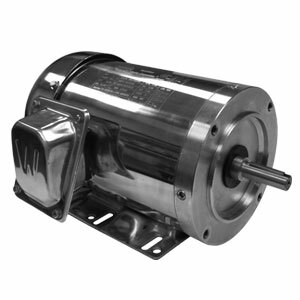 2 HP, 1800 RPM, 6.0 Amps @ 208-230V, 3.0 Amps @ 460V, 51 lbs.